A wonderful antique 9kt yellow gold necklace, made by Birks Canada. 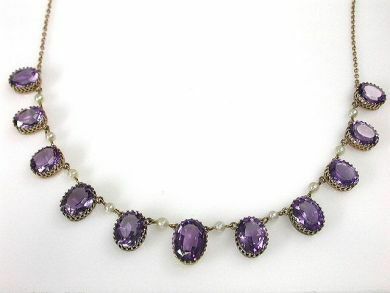 It features 1 oval faceted cut medium purple amethyst, est. 5.65ct; 10 oval faceted cut medium purple amethysts, est. 33.96ct and 10creamy-white cultured pearls, approx. 3.75mm.